Taylored orthoses for big and small. Dynamic inserts (= DFO) and dynamic ankle spanning orthosis (= DAFO) are widely used in patients with neuromotor disorders. The incorporated and individually adapted footbed increases active tone control, as well as ankle, subtalar joint and forefoot stability. The development of the active balance mechanisms is supported, improving the balance of walking and standing. For the treatment of patients with spina bifida, DFS and DFOs are used at a lesion height of at least S3. The goal is stabilization of the medial arch of the foot, erection of the heel and correction of existing deformities.For the treatment of patients with spina bifida, DFS and DFOs are used at a lesion height of at least S3. The goal is stabilization of the medial arch of the foot, erection of the heel and correction of existing deformities. Due to the advantageous material properties, the DFOs or DAFOs are predominantly made of thin, flexible polypropylene and, if required, of fiber composite material. 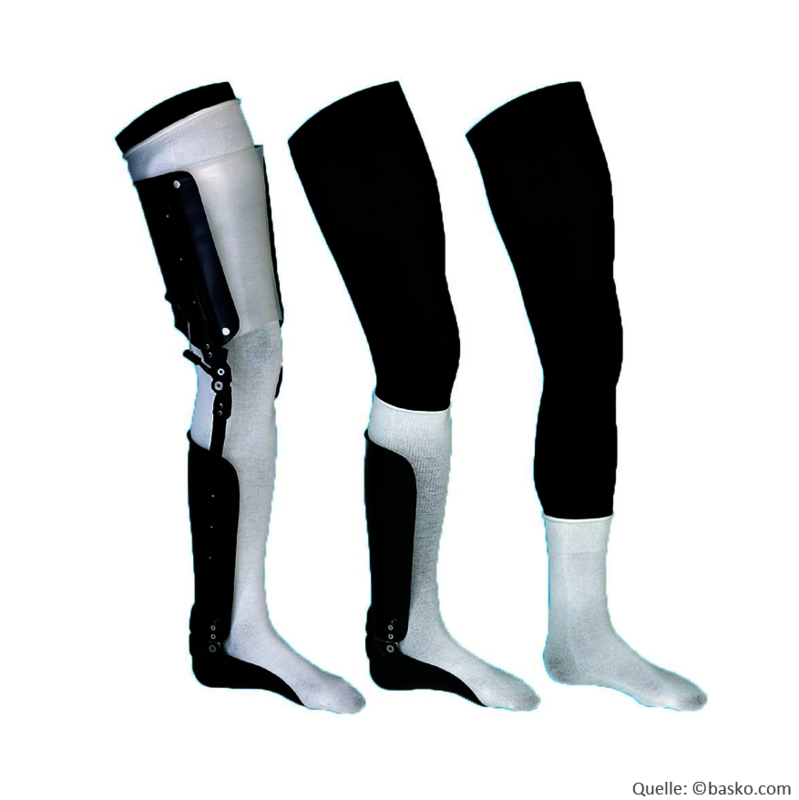 Lower leg orthoses are used in cases of paralysis with a lesion height up to L5. They compensate the deficit in the erection in the leg, which is caused by the weakness of the calf muscles. Depending on the clinical picture, body weight, size and degree of activity different mechanical ankle joints or carbon springs can be selected. Lower leg orthoses enable fluid and natural walking and provide more safety and often almost unlimited mobility for everyday life and leisure. Carbon springs enable a harmonious, energy-saving and thus physiological walking. Patients with good coordination can even run and jump. During the heel strike and stance phase the carbon spring takes in energy and release it during the repulsion phase. Less effort is needed in the hips and knees, the ankle joint is supported, and the knee can be better stretched and flexed while walking. Technical information on all joints can be found in our Online Shop. Thigh orthoses are used in paralyzes with a lesion height of S1 to L4. At these levels of paralysis, the hip adductors and hip extensors are usually affected. At L4 also the knee extensors are weakened. Thigh orthoses support the leg as well as controlling the position of the foot so that a safe walking and standing is possible. By combining different mechanical knee and ankle joints or carbon springs, the orthosis is individually adapted to the activity and requirements of the patient. This creates more safety, mobility and wearing comfort in everyday life and thus leads to more quality of life. We use joints and carbon springs from Gottinger as well as joints made by other manufacturers. An overview of all parts developed by Gottinger can be found in our Online Shop. With a paralysis level from L3 to L2, partially the knee extensors, the entire foot muscles, the hip flexors and all hip extensors are affected. Mostly there are hip luxations on one or both sides and clubfeet. In L2, spinal deformities such as scoliosis are added. 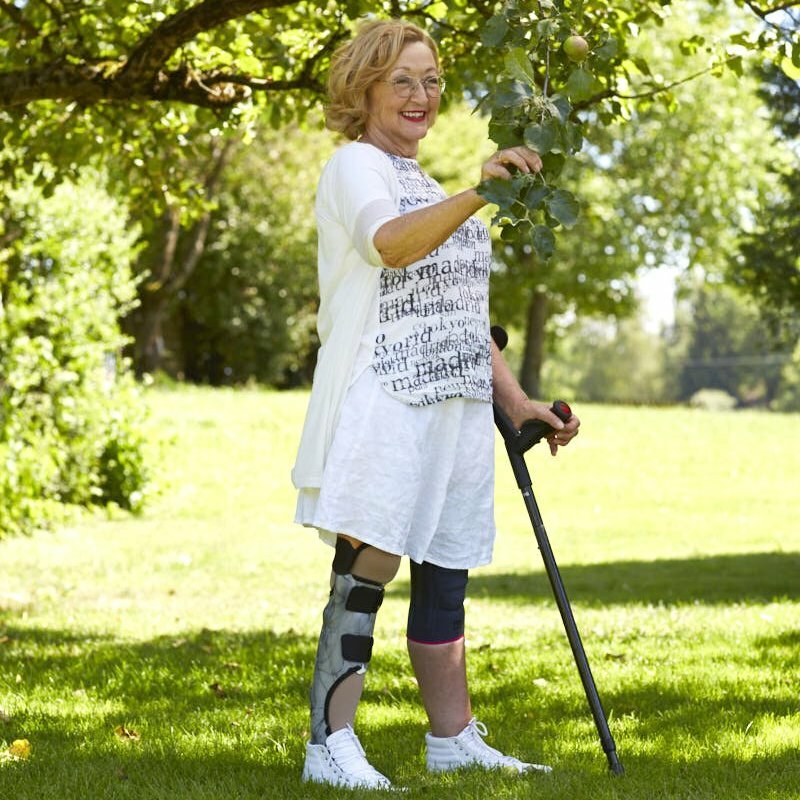 Without an orthosis, free standing or walking is no longer possible. In the case of higher lesions from L1 to TH5, in addition to storage contractures, standing and walking are often no longer possible without bracing with the arms. Hip orthoses allow safe walking and standing. The paralyzed body regions are stabilized and erected by the orthosis, training the spatial perception, strengthened bone and muscle structure and improves the bladder and intestinal function. The orthosis grasps the pelvis via a hip basket and stabilizes the trunk. Normally different hip, knee and ankle joints made by Gottinger are used and combined depending on the clinical picture and the level of paralysis. The Gottinger joint systems enable the construction of robust, functional and lightweight orthoses in unilateral construction. Up to a lesion height of L2, the Salera hip joint is usually used. With the Salera often also running and playing is possible, which making especially children more independent and self-confident. For higher lesions, we use the Twister or RGO hip joint. If the feeling of space and equilibrium is not well developed, the GoLiTE can nevertheless help to get up and moving. More details about the joints can be found in our Online Shop. Positioning orthoses are used for correction prophylaxis. The aim is to counteract secondary malpositions that can result from a muscle imbalance or paralysis-related malposition. For the correction of contraceptives different versions of square joints are additionally used. Furthermore, positioning orthoses are used postoperatively for the maintenance of surgical results. Depending on requirements, positioning orthoses are manufactured from lower leg height to hip height. They mainly consist of a PE shell or acrylic resin, which are equipped with a padding inside. Positioning orthoses that reach up to the hip can also be used for standing when attached to a footplate. By adapting the positioning orthoses on a rolling board, the children get a first opportunity to move independently in a vertical position in a limited space. 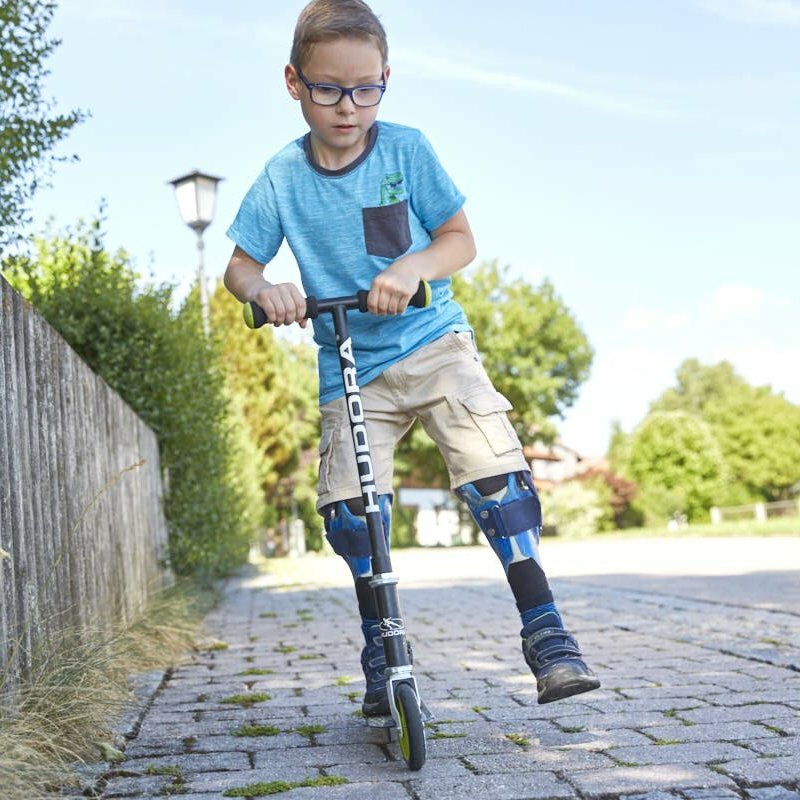 With sufficient coordination and increased activity, treatment with a Go-LiTE will be used to further promote children's mobility and increase the radius of travel. 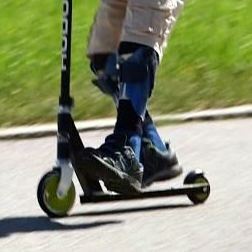 The Go-LiTE is a further development of the Swivelwalker systems. Due to the complete production of carbon fibers, the weight could be significantly reduced compared to similar products. The center of gravity in the Go-LiTE has been set far down, which gives it maximum stability and thus safety. In the context of trunk orthotics, spinal deformities are stabilized and corrected with the help of corsets and thoracic orthotics. One focus is the supply of idiopathic and neuropathic scolioses.In the context of trunk orthotics, spinal deformities are stabilized and corrected with the help of corsets and thoracic orthotics. One focus is the supply of idiopathic and neuropathic scolioses. 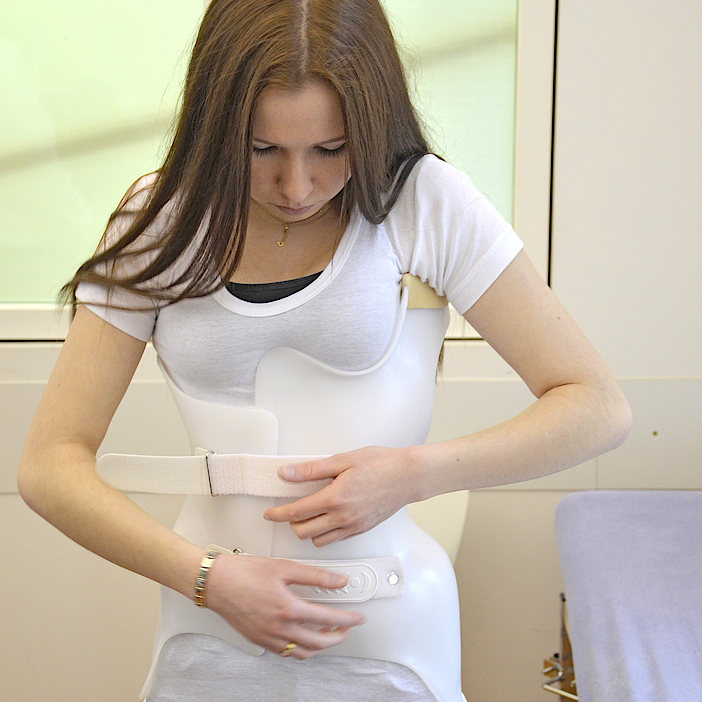 In order to support neuropathic scoliosis as well as to achieve the ability to sit with a high degree of paralysis, the production of a semi-flexible corset takes place. This corset is made of a flexible thermoplastic material (Duraflex). for reinforcement so-called carbon spines made out of carbon are attached to the back and if necessary on the sides. Due to the flexibility of the material a certain freedom of movement is given. The attached carbon spines provide the corset its necessary rigidity and support. For the supply of idiopathic scolioses, the thermoplastic material polyethylene is generally used. Correction of the scoliosis is achieved via appropriately integrated pressure zones and clearances. Measuring takes place via the scanning technique, as far as possible. Thus a plaster cast is not needed. Pediatric orthopedics is very important to Gottinger. Typical diseases we treat are spina bifida, scoliosis, ICP or osteogenesis imperfecta (vitreous bone disease). Managing director Norbert Günther started as one of the first in the 90s to develop joint systems especially for children which were smaller and lighter and stand up to special requirements such as playing in the sand. Since then, our joints, material selection and manufacturing processes have continued to improve in terms of comfort and function. In the hospitals in Munich, Aschau i. Ch., Mainz and Berlin we work together in interdisciplinary teams consisting of doctors, therapists and technicians and in consultation with the patients and parents in order to reach the common goals of treatment. 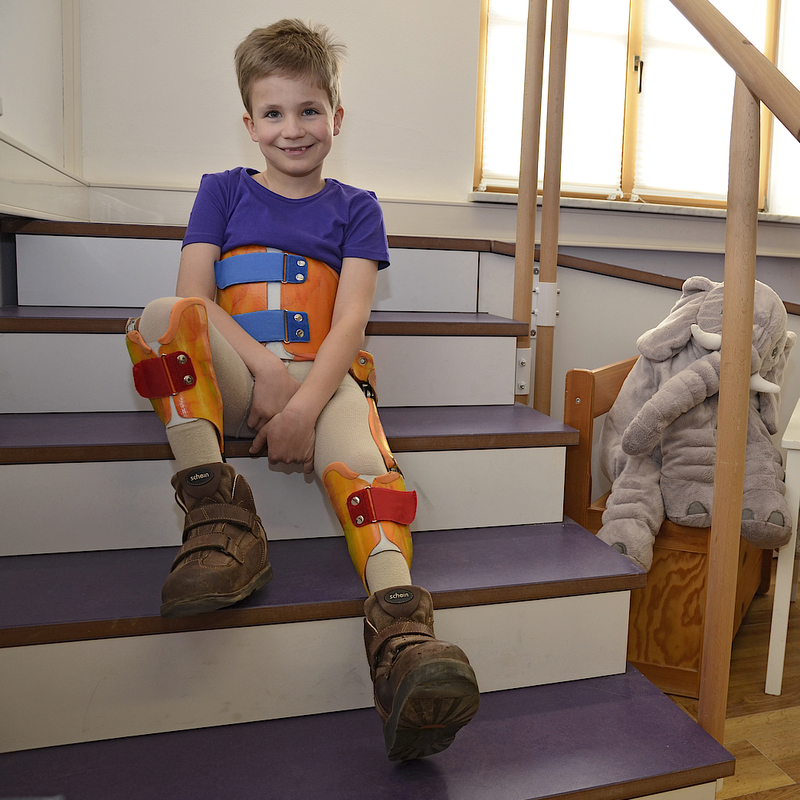 We adjust the orthosis at regular intervals to the growth and changing demands of the patient. Twenty years ago, Norbert Günther, managing director and orthotic specialist of Gottinger, established the concept of Dr. Ing. Ferrari (Ferrari concept) in Germany. 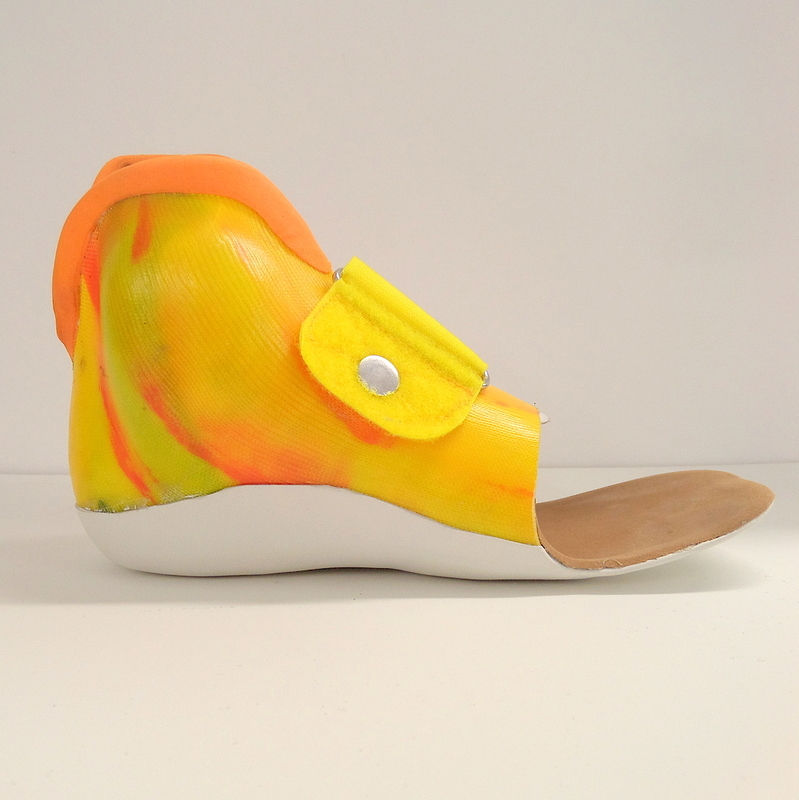 It allows the production of special orthoses for each lesion height. That means they are suitable for the respective degree of paralysis of children with spina bifida. Through interdisciplinary cooperation with physicians and physiotherapists not only the acute clinical picture is used for the construction of the orthosis. Also therapy goals or upcoming operations are considered. In this way, we specifically work with the appropriate orthosis on the success of the treatment set in the treatment plan. The outstanding care at Gottinger is based on a comprehensive initial discussion. In the personal consultation, all open questions are answered and the wishes of the patient are discussed. No orthosis is created simply by prescription. When planning the care in consultation with doctors and physiotherapists or occupational therapists, the patient is considered as a whole: What is the further course of treatment? Are operations planned? What wishes does the patient have regarding hobbies and so on? So we work together towards a defined holistic care goal. The networks at the different locations in Zorneding and Munich, in Berlin, Mainz and Aschau im Chiemgau are so good that Gottinger can quickly fall back on the professional opinions of the most diverse doctors and therapists. Patients with a poliomyelitis virus infection suffer their whole life under the consequences of permanent paralysis, so-called residual paralysis. When a post-polio syndrome occurs, symptoms such as increased muscle weakness and muscle atrophy can occur, severely affecting standing and walking. The weak muscles are often the reason for increasing joint instability, which is why those affected are also exposed to a higher risk of falling. We try to counteract this with the best possible individual orthoses. The staff take extra time for our polio patients to work with the affected person to produce a functional yet comfortable orthosis. Particular attention is given to individual needs, so that everyday mobility is maintained or even increased, thus improving the quality of life. For orthopedic orthoses in cases of paralysis, Gottinger mainly uses unilateral joint systems and carbon springs from our own development. Orthoses by Gottinger are particularly easy to put on and take off and are built in such a way that they can be quickly adapted to the changing demands in therapy and everyday life. The unilateral construction not only makes the orthosis lightweight, but also allows more freedom of movement. For example, crawling and cycling are possible even with a hip orthosis with Salera Preselect. The Spring carbon spring returns energy during the kick-off phase, which it picked up during the heel strike and stance phase. As a result, patients can even walk and jump with good coordination. Find out more about the Gottingen joint systems here. With smart ideas and years of experience, our technicians and engineers are constantly looking for improvements. For the sake of patient comfort, our own joints for orthoses in unilateral design have been developed for decades. Examples are the Spring carbon spring and the Salera Preselect hip joint. Modern manufacturing processes such as 3D laser printing or high-quality materials such as prepreg are used for the construction of orthoses. It is always weighed whether the modern age is better than classic manual work. Gottinger is known in the industry and among patients for quality and know-how and is considered the right contact for doctors and therapists when it comes to difficult cases. Even supplies for which no standard components are available, we treat successfully with sophisticated custom-made products. New customers are sometimes surprised by our comprehensive and competent advice. Focusing on customers with their needs means taking our time to listen and to work together to find out how the treatment can best support the patient and bring him or her closer to the goal of the treatment. This goal is discussed by physicians, therapists and technicians in consultation with the patient or the parents and takes into account questions such as: What is the further course of treatment? Are operations planned? What wishes does the young patient have regarding hobbies, etc.? We are also happy to talk to your doctor or therapist before writing out the prescription to develop the perfect orthosis for you. Whether it is a concrete prescription or a conversation in advance, the orthotics masters always have an open ear and take their time for the patients. Gottinger informs about all options, such as custom-made. The personal orthosis is made on the basis of a scan or plaster cast. During fitting, the accuracy of fit and function are checked in the dynamic motion sequence before it comes to completion and final acceptance. 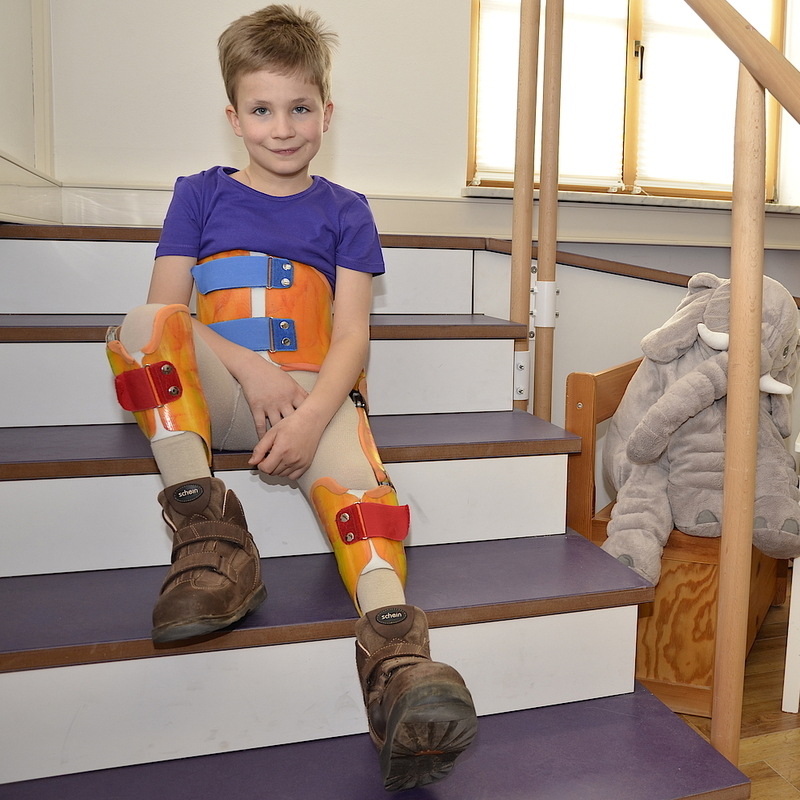 The result is an orthosis that is comfortable to wear and makes walking and playing easier. Regular controls and adjustments to growth and current requirements ensure sustainable therapeutic success. If no fitting is required, our delivery service is happy to help you. We bring new prostheses to you in the hospital or rehabilitation center. Orthoses are shipped worldwide via UPS. Gottinger offers a comprehensive service for maintaining the function of the medical aids. You can also get help quickly by phone if you have special questions or problems that arise. Depending on the orthosis you can choose between special orthotic shoes. These are cut so that they leave room for the orthosis in the shoe. In addition, different sizes and widths can be selected for each foot. The shoe is made to allow easy putting on and taking off and, thanks to selected materials, it has comfortable wearing properties. You can choose the right shoe from a large selection of shoes from different manufacturers. Special socks are usually worn underneath the orthosis. This ensures a comfortable fit of the orthosis and prevents pressure points, constrictions and circulatory disorders. Through selected materials transpiration moisture is carried from the skin to the outside. In all our branches, you will get the right orthotic stockings for your care. It is recommended to wear a corset shirt to avoid chafing under the corset. The special shirts are tight, seamless and longer than ordinary T-shirts. Different materials such as cotton, polyester or elastane provide the desired wearing properties. Corset shirts are available in different styles and with special armpit protection zones. You will receive these at our locations.